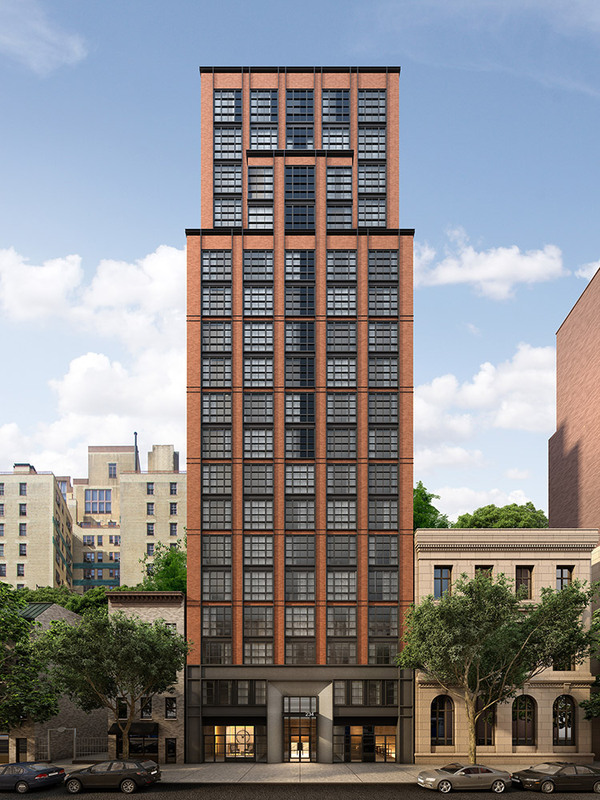 With dramatic design and architecture that pays homage to the historic Gramercy neighborhood, 234 East 23rd Street, developed by The Naftali Group, makes its debut to the marketplace today. The striking 20-story new construction tower will house 57 luxury condominium residences that feature rich interior finishes and incredible views over the Manhattan skyline, as well as boutique hotel-inspired amenities and lounge spaces. Residents will enter the building through a double height lobby designed by Rottet Studio, in their first ever partnership with a residential real estate developer. Known for their work in refined hotel spaces, such as The Surrey and the Loews Regency in New York, and the St. Regis in Aspen, the aesthetic of both the impressive common spaces and high-quality residential finishes embodies the appearance of a boutique hotel. Architect Goldstein Hill & West has created an authentic, brick and metal structure that embodies the neighborhood’s rich heritage and charm, punctuated by large floor-to-ceiling casement windows that invite the generous light into the apartments. The residences, comprised of one- to three-bedrooms ranging from 602 to over 2302 square feet, are inviting and comfortable, with incredible light and views through floor-to-ceiling casement windows. Solid white oak floors add a warm aesthetic, while beautiful detailing and crafted finishes come together with flexible layouts, interspersed with unique build-outs and alcoves. Many of the residences have private terraces, including large outdoor spaces at the full-floor penthouse. 234 East 23rd’s stylish and modern kitchens tie functionality and beauty seamlessly together. Integrated Bertazzoni, Bosch and Subzero appliances combine with plentiful storage, generous work surfaces and flexible layouts to accommodate entertaining. The building’s bathrooms are defined by clean, contemporary lines and elegant materials, including marble lined floors and walls, custom casement-style glass doors and custom-made vanity units, crafted with Carrera marble. There is also a Bosch washing machine/dryer in each apartment. The building offers striking, yet comfortable amenities designed to be an extension of one’s home, including public outdoor spaces perfect for both relaxing and entertaining. The quiet second floor garden terrace is complemented by the roof terrace, complete with a barbecue grill and outdoor kitchen. The amenities are rounded out by a spacious resident’s lounge and library with a billiards table, kitchenette/bar, as well as a modern fitness center. There is also a doorman, concierge service through Abigail Michaels, individual private storage units and bicycle storage. Prices for the apartments range from $885,000 for a one bedroom to over $6 million for a four-bedroom penthouse with substantial private outdoor space. Occupancy is available in the third quarter of 2015. For more information, please visit the website at 234e23.com or call the sales office, located at 346 Park Avenue South, 4th floor (at 25th Street), at 212.234.2330. Founded by Miki Naftali and Victor Sigoura, the Naftali Group is one of New York’s most active real estate developers of residential, commercial, institutional, mixed-use and retail properties. Collaborating with leaders in interior design, architecture and construction, the group is committed to excellence in developing properties that are exceptional in their attention to detail, quality, sustainability and design. Naftali Group currently owns, operates and is developing 12 residential properties in prime neighborhoods throughout New York City made up of more than 1000 units and approximately 1,000,000 square feet. As a builder, owner and operator, Naftali Group’s portfolio includes 277 West 10th Street, 182 West 82nd Street, 210 West 77th Street, The Seymour at 261 West 25th Street, 234 East 23rd Street, 245 West 25th Street, The Landmark Park Slope, The Bergen, 33 Beekman and other multifamily assets and investments throughout New York City. For more information please visit www.naftaligroup.com.